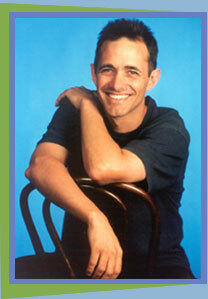 Andy Griffiths was born September 3, 1961 in Melbourne, Australia. Before he started writing full-time, he was a teacher. He is in constant demand to speak at schools and writing workshops. Andy gets his story ideas from ordinary life. Physical Description: 239 p. :ill. ;22 cm. Physical Description: 345 p. :ill. ;22 cm. Physical Description: 346 p. :ill. ;22 cm. Summary: Explores annoying habits and annoying situations. Summary: Before introducing the world to butts gone bad, Andy Griffiths unleashed the bestselling JUST books. The series continues to amuse, annoy, and totally ick out readers with this latest collection of just stupid stories. Physical Description: 1 sound media player (ca. 2 hr., 45 min.) :digital, HD audio ;3 3/8 x 2 1/8 in. Summary: A practical joker finds that his practical jokes backfire.